Installation of a car stereo can be a relatively easy thing to do. 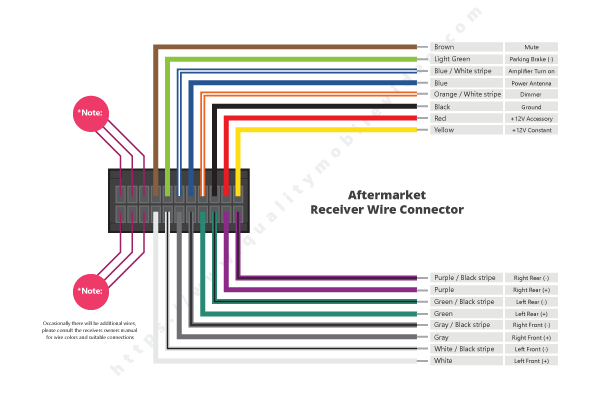 To make the process easier the aftermarket has come up with a color scheme for all of the wires that you will need to connect to make your new aftermarket car stereo work with your vehicle. QualityMobileVideo.com carries a vehicle-specific wiring harness and interfaces for virtually every vehicle, we suggest you use it to connect your new stereo to your vehicle’s factory wiring harnesses. This will ensure proper connection to the appropriate signals and works seamlessly, without cutting any of the factory cables just like the factory stereo did. When removing a factory radio and replacing it with an aftermarket radio, you will need to use a wire harness or interface. 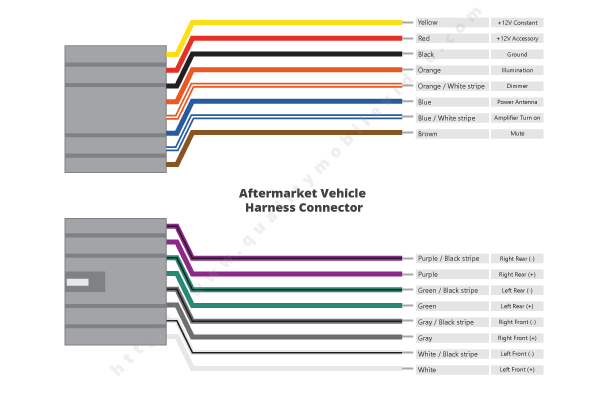 Wiring harnesses allow you to make color coded connections without modifying the factory cabling and connectors . Some vehicles require the use of an interface*; an interface prevents vehicle errors, provides full integration to factory equipment (Amplifiers, Steering wheel controls) when removing the radio due to factory data-bus systems. When installing an aftermarket receiver you will match the functions of the aftermarket wire harness with that of the aftermarket receiver. The wire colors of your new receiver may, or may not, match the wire colors of the aftermarket harness. The aftermarket harness will include a key that indicates the wire color and function, you will match these with the aftermarket radio harness by function. These connections must be soldered and insulated to prevent accidental shorts. Insulated crimp connectors are also suitable. Yellow + Constant 12 volt power source regardless of key position. Red + Accessory 12 volt power source requires turning of the key position. Orange + Illumination wire, provides 0 volts when lights are off and 12 volts when the vehicle exterior lights are on. Orange / White stripe + Dimmer wire, provides 0 – 12 volts from the vehicle and is adjustable with interior light dimmer control. Blue + Power antenna, provides 12 volts from the receiver when the FM or AM radio is being used. Turns off on any other source. Blue / White stripe + Amplifier turn on, provides 12 volts from the receiver when receiver is turned on. Brown + Audio Mute (Not common and not used in most applications). Light Green – Parking brake, vehicle provides a ground signal when parking brake is pulled up.